Ideal to protect your family, this Whirlpool Minerala 90 Classic RO 8.5L Water Purifier will give you germ-free and pure drinking water. Featuring Unique Mineral Enrichment System, this purifier adds back the essential natural minerals back to water, which is lost in the filtration process. 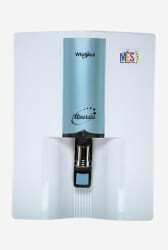 Moreover, this water purifier optimises space and looks good in modern kitchen.